Autistic children do not learn in the same way that children normally learn. They seem to not understand simple verbal and nonverbal communication, respond differently to sensory input, and withdraw in varying degrees from people and the world around them. They show little interest in other children and tend not to learn by observing and imitating others. 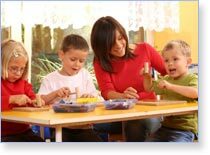 They become preoccupied with certain activities and objects that interfere with development of play. Although children with Autism Spectrum Disorder (ASD) exhibit common behavioral deficits (e.g., communication and social) and excesses of stereotypic sensory behaviors, there are tremendous differences among children. For example, although many children have limited understanding and use of language, there are children with ASD who may be able to understand complex language, express their needs or even converse. Their language deficit may involve difficulties of grammar or speaking in a robotic fashion. Children with ASD also demonstrate a variety of social deficits. Whereas some children may reject all social contact, there are children who are quite social. However, they may only be social around adults and have no interest in children. Or the may be interested in children but do not initiate or sustain interactions. Similarly there are tremendous differences among children’s self-stimulatory behaviors. Some children may exhibit repetitive body movement while others line up objects, tap surfaces repetitively, or rewind a DVD to endlessly watch a particular scene. Some children may not demonstrate any noticeable motor stereotypies but have complex and obsessive rules.